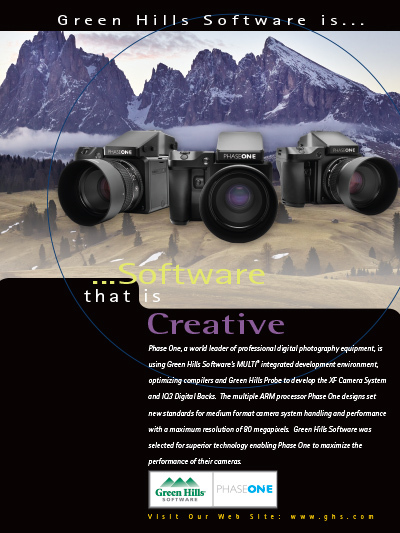 Phase One, a world leader of professional digital photography equipment, is using Green Hills Software�s MULTI integrated development environment, optimizing compilers and Green Hills Probe to develop the IQ series digital cameras. The multiple ARM processor Phase One design sets new standards for medium format camera system handling and performance with a maximum resolution of 80 megapixels. Green Hills Software was selected for superior technology enabling Phase One to maximize the performance of their cameras.